Download a mailing list of VPs of sales and start selling to the sales experts via email, mail, or phone. 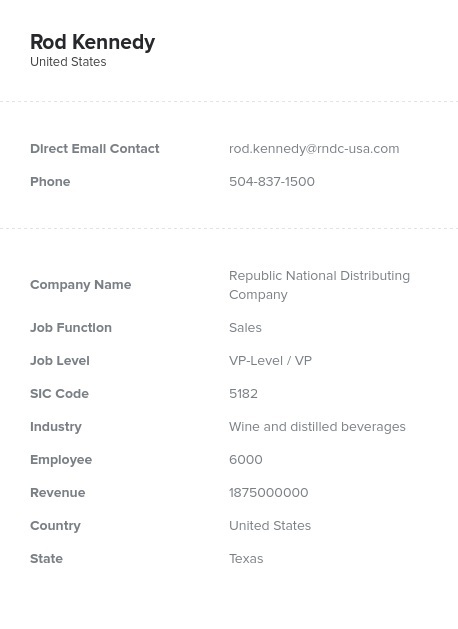 Our vice president of sales email database is full of the direct contact data you need to connect with the leaders of sales teams! A senior vice president of sales needs many different tools at their disposal to help manage their teams of sales professionals: software like a good CRM, outsourced marketing services, lead generation tools, and, of course, realistic ways to help them keep track of the effectiveness of their staff and sales tactics. If your team has a product, software, or new service to help them bring more business to their business, this B2B contact list of targeted sales leads is the perfect resource. Within our c-level and senior sales executives email list, you'll find vice presidents of sales, chief sales officers, and similar sales management professionals. This list is organized by job title, and unlike our other ready-made lists sorted by industry, with it, you'll be able to find the specific group of people at numerous companies who have the authority to make key decisions and a great deal of influence over their respective departments. Our VP of sales email list allows you to access this group of professionals with the same business goals and needs and email leads directly. This Sales VPs email marketing list, has everything your marketing team needs: emails, phone numbers, addresses, real names, and more, are all included and human-verified. Buy our chief of sales email database and reach out to the leads who are looking for more leads today!